Addon that called “Controllable Rideable Dolphins” implements in Minecraft: Bedrock Edition (Minecraft PE) long-awaited feature for dolphins. This addon will replace the in Minecraft Bedrock texture and model skulls, so You will be able to get a skull of the new mob! “Armored Ocelot” will do ocelots in Minecraft even more useful, because now they will have armor, and even tamed an ocelot it will be possible to ride! 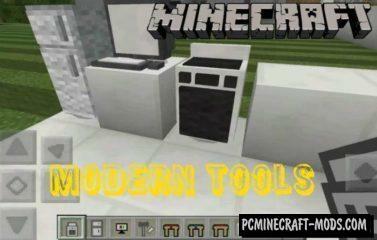 If you need modern furniture and tools, then this addon will be a great addition to the standard world of Minecraft PE. The addon is able to add about 10 new types of furniture, which is perfect for any room in the house. Mod “Update Aquatic” created enthusiast and adds in Minecraft Pocket & Bedrock Edition four new mob, which will be officially added to update the “Oceans” in the next year! With this addon, You will now be able to see some mobs that will be added in the large-scale upgrade of the oceans and seas for Minecraft next year! Just yesterday, the developers announced the new mob in Minecraft – the tortoise and the fans already started to make concepts! You still think, that water hostile mobs not can inflict harm those who is on land? This addon will change your idea that it is not always safe to be near the water. “Christmas” Mod will replace some of the standard items in Minecraft Bedrock on things associated with New Year.